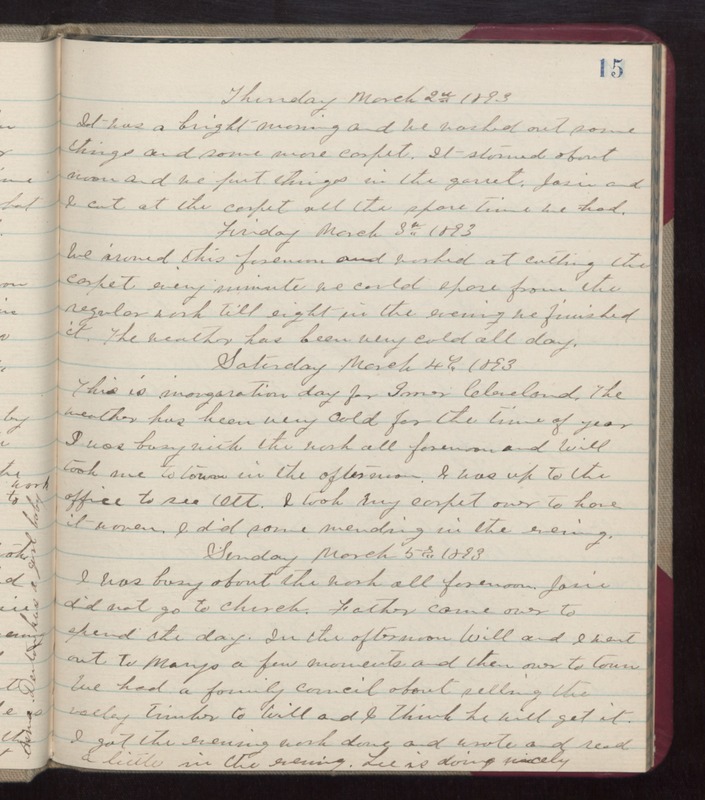 Thursday March 2nd 1893 It was a bright morning and we washed out some things and some more carpet. It stormed about noon and we put things in the garret. Josie and I cut at the carpet all the same time we had. Friday March 3rd 1893 We ironed this forenoon and worked at cutting the carpet every minutes we could spare from the regular work till eight in the evening. We finished it. The weather has been very cold all day. Saturday March 4th 1893 This is inauguration day for Grover Cleveland. The weather has been very cold for the time of year. I was busy with the work all forenoon and Will took me to town in the afternoon. I was up to the office to see Ott. I took my carpet over to have it woven. I did some mending in the evening. Sunday March 5th 1893 I was busy about the work all forenoon. Josie did not go to church. Father came over to spend the day. In the afternoon Will and I went out to Marys a few moments and then over to town. We had a family council about selling the valley timber to Will and I think he will get it. I got the evening work done and wrote and read a little in the evening. Lee is doing nicely.